As we keep a stiff upper lip, we might recall that it was on this date in 1952 that Britain became the third country to conduct an atomic bomb test. 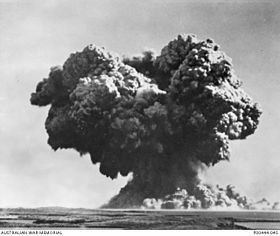 Its “Operation Hurricane” was carried out at Monte Bello, Australia, using an improved plutonium implosion bomb similar to the U.S. “Fat Man” (detonated over Nagasaki). To test the effects of a ship-smuggled bomb (a threat of great concern at the time), Hurricane was exploded inside the hull of the HMS Plym (a 1,450 ton frigate) which was anchored in 40 feet of water 400 yards off shore. The explosion, 9 feet below the water line, left a saucer-shaped crater on the seabed 20 feet deep and 1,000 feet across.